Nationality: Canadian/American. Born: Beirut, Lebanon, 2 September 1964, to a Chinese-Hawaiian father and British mother. Education: Attended High School for the Performing Arts, Toronto, was graduated in 1982; studied acting at Hedgerow Theatre, Moylan, Pennsylvania, and at Lea Posluns Community Theatre, Toronto. Career: First professional stage and TV roles, in Toronto, 1984; moved to Los Angeles, 1986; won serious critical attention for role in River's Edge , 1987; popular success as action hero in Speed followed by stage production of Hamlet in Winnipeg, 1994. Awards: Blockbuster Entertainment Award for Favorite Actor-Action/Science Fiction, and Csapnivalo Award (Budapest) for Best Actor in a Leading Role, for The Matrix , 2000. Agent: Creative Artists Agency, c/o Erwin Stoff, 9830 Wilshire Boulevard, Beverly Hills, CA 90212, U.S.A. Address: 581 N. Crescent Heights Blvd., Los Angeles, CA 90048, U.S.A.
Johnson, Sheila, Keanu Reeves: A Biography , London, 1996. Membry, York, Keanu Reeves , New York, 1997. Robb, Brian J., Keanu Reeves: An Excellent Adventure , London, 2000. Snowden, Lynn, "Keanu Reeves," in Rolling Stone (New York), 9 March 1989. Ansen, David, "Goodbye, Airhead," in Newsweek (New York), 13 June 1994. Slack, Lyle, "Keanu's Excellent Adventure," in Maclean's (Toronto), 23 January 1995. "Hollywood to Hamlet," in Plays and Players (London), March 1995. Shnayerson, Michael, "Young and Restless," in Vanity Fair (New York), August 1995. "Keanu Reeves," in Film Review (London), March 1996. Kaplan, James, "Why Keanu Reeves Won't Sell His Soul," in Premiere (Los Angeles), September 1997. For someone whose acting talents have been judged slight by a number of critics, Keanu Reeves has nonetheless attracted the interest of several distinguished film directors, from Bernardo Bertolucci to Stephen Frears, along with younger independents like Gus Van Sant, who have cast him in important roles. And for someone who might have sustained a major career in nothing but light comedies and action-adventure films, Reeves has often chosen parts that are far from standard Hollywood fare, from a bisexual street hustler who is also a modern-day Prince Hal to a very different prince, Siddhartha the Buddha. Since his great success as an action hero in Speed his roles have, to be sure, been more frequently mainstream, and in The Matrix , as a hero in virtual mode most of the time (not to mention his cool black trenchcoat in the climax), he has come closer to being a pure iconographic figure than almost any star before him. Largely a Torontoan in upbringing and theatrical training, Reeves retained a youthful demeanor long enough to allow him to play troubled or airheaded teenagers well into his twenties. In one of his earliest starring roles, in The Prince of Pennsylvania , a film that veers uneasily between family melodrama and farce, Reeves typically has little vocal range: often he sounds as if he has a head cold, and for the most part looks rather blank. All the same, he seems perfectly cast as a disaffected youth of the 1980s, guarded and unrevealing of inner feelings, yet with occasional surprisingly playful or sarcastic moments. It is very far from a Method performance, as we can see most clearly by comparing him with his costar in a later film, My Own Private Idaho : here, every flicker of River Phoenix's face registers some dream or torment, while Reeves, as the unforthcoming "Prince Hal," the supposed best friend of Phoenix's narcolept, remains masked. Is it Reeves or the character who is masked, we may ask, and in either case is there anything behind the facade? This may be either good acting or astute casting on Van Sant's part for the role of a seemingly affectless modern youth. In the case of Little Buddha , the question of acting ability seems almost irrelevant. Bertolucci too made an inspired choice in casting Reeves as Prince Siddhartha, if only for his sheer screen presence: he has the bearing of an Indian prince (or a movie star), with the handsomeness of an undefined nationality along with a seeming inwardness, to make the pageantlike historical segments of the film work brilliantly. Playing livelier, more impetuous characters, Reeves makes more use of a boyish intensity, whether he is the hippie lover of Parenthood or a more aristocratic swain in Dangerous Liaisons. In the Bill and Ted comedies, Reeves shows far greater animation in his jovial goofiness than his truly blank costar, Alex Winter. Yet in certain roles where he must be a stock leading man ( Bram Stoker's Dracula ) or where the director seems incapable of getting anything interesting out of the character ( Johnny Mnemonic ), Reeves is a virtual cipher. In A Walk in the Clouds his extremely reserved demeanor does work, even though the role calls for an old-fashioned heart-on-sleeve romantic warmth: perhaps because his performance is a striking contrast to the heated ones of his Hispanic and Italian costars, perhaps because the camera registers him as a genuine movie star, "the true prince," the way Falstaff recognizes Hal by "instinct." In Speed Reeves gives a more nuanced performance, despite the formula role. Still exhibiting traces of his Valley Boy persona while playing a heroic cop, he brings a deliciously comic note to moments of suspense, as when Jack tries to calm a gunman who cannot recognize the larger peril of the boobytrapped bus: "I don't know you, man. I'm not here for you. Let's not do this. . . . I don't care about your crime. Whatever you did, I'm sure ( pause ) that you're sorry. So it's cool now." Most important, he also brings a combination of physical energy and enough animation of face and voice to suggest possibilities of true range in future film roles. The promise remains to be fulfilled, though in The Devil's Advocate he does give an unusually forceful performance as—quite literally—the title character, a smooth and confident Southern lawyer (sporting a mild Elvis accent) hired by the Prince of Darkness himself (Al Pacino) to work at a high-powered New York firm. Reeves succeeds in some courtroom speeches that call for an aggressiveness held in check, with an underlay of doubt or guilt, and he rises to moments of furious anger and horror as his character's life comes apart, while always serving as a model of relative normality against Pacino in a flamboyant, wickedly comic performance. Reeves has continued to support low-budget independent projects, such as The Last Time I Committed Suicide , in which he appears pale and puffy-faced in a supporting role as proto-beatnik Neal Cassady's loser of a drinking buddy. Feeling Minnesota (a black comedy that rather pales in comparison to another saga of the Upper Midwest , Fargo ) offers him an essentially passive role as an ex-con embroiled in a murderous plot involving his brother's wife. Shy, wary, puzzled, his character does little but react to the more extreme behavior of others, notably Vincent d'Onofrio. Passivity and wariness are the keywords too for what may well turn out to be his most defining role, as the Chosen One/Neo, in The Matrix. Neo is, of course, ultimately an action figure, with the classic American hero's perfect blend of modesty and grim determination; but all the same, scene after scene calls for him simply to be astonished, while all the other characters speak in archly knowing, portentous tones. 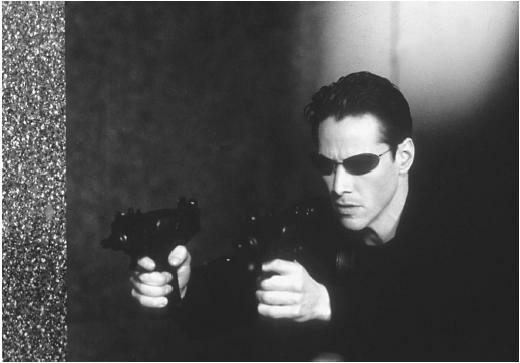 What is perhaps most significant about the role is not only that Reeves plays a character who leads a computerenhanced life, but that Reeves' own body is frequently computerenhanced, most memorably as he dodges bullets and goes though "heightened" martial arts movements. Theorists who have written about the absorption of the post-human body into the machine in films like the Robocop and Terminator series should have much to say about the virtual Keanu in The Matrix , a film in which a star's riveting screen presence is not just partially a result of makeup and lighting (as has always been the case) but frequently a design on a computer grid.